The Foundling Hospital was designed by Theodore Jacobsen with possible influence from Roger Morris and the 9th Earl of Pembroke. The interiors were predictably plain and austere, except for the administration and public rooms in the West side of the West wing: the Court Room, Committee Room and Picture Gallery. Even in the last two areas architectural interest was limited to the chimneypieces. 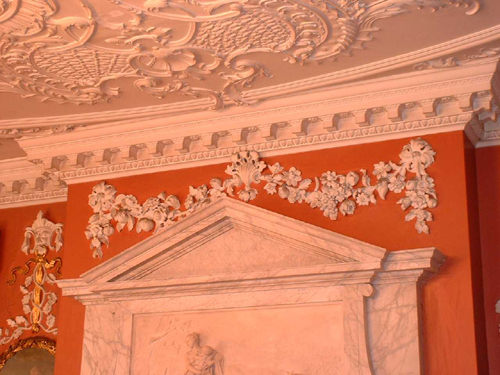 Only in the Court Room was elaborate decoration employed, in the form of carved swags of fruit and flowers on the walls and a magnificent Rococo ceiling. The ceiling was executed by William Wilton (fl. 1722-65) father of the sculptor Joseph. The foundation stone of the West wing of the Hospital was laid on 16th September 1742, and the building was formally opened on 1st October 1745. By the early twentieth century a combination of concern for the health of the children in a crowded, polluted capital and the inevitable commercial value of the site led to plans to move the Hospital. The sale was completed on 25th November 1926 and the children were transferred to a new site in Hertfordshire. A few of the architectural elements of the old building were removed and put into store while a new headquarters was built on part of the old site. Some of these early elements were installed in the re-assembled Court Room and Committee Room, which formed part of the new building, put up in 1937. The Foundling Museum now occupies this building. I was commissioned to carry out the paint analysis of the early interiors. 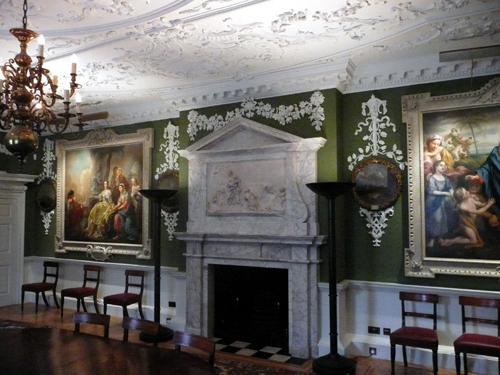 The walls (and possibly all the joinery) of the Court Room appear to have been painted a dull olive green originally. The plasterwork and ceiling were off-white and there was no gilding.